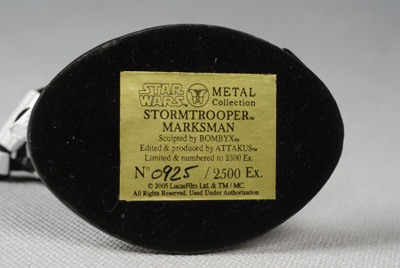 Attakus has been producing fine collectibles for a decade now, and one of their hallmark licenses has been Star Wars. Most of their work is sixth scale (approximately) statues, and words like 'quality' and 'beautiful' are often associated with their work. As you might expect, the word 'cheap' is not. But Attakus also produces some very unique metal collectibles for several licenses. 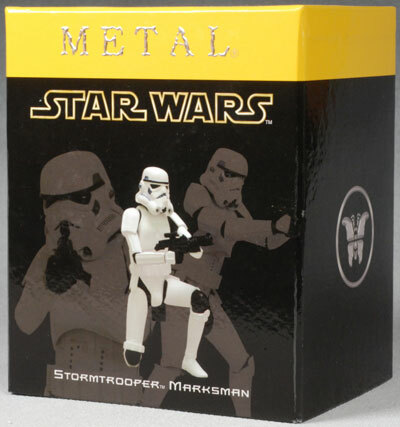 Once again, Star Wars is in that list, and I'm reviewing the Stormtrooper Marksman metal figure tonight. 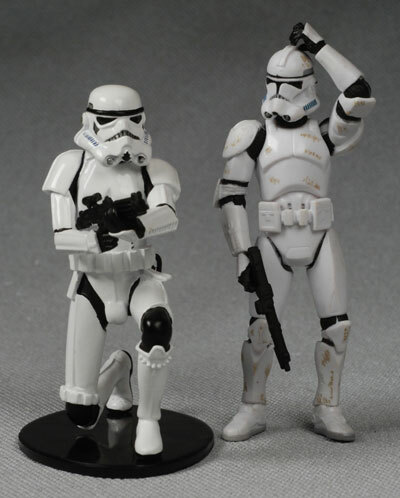 There's actually several Stormtroopers, each in a different pose, along with several main characters like Leia, Vader, Obi-Wan etc. There's even a large diorama of the Falcon and part of the Death Star hangar, so that you can display your metal figures in extreme style. The suggested retail on this guy is $95, but you can find them out there for about half that with a little work. This guy, like most of them, is a limited edition of 2500. Now this is some cool protective packaging! He comes in a large box, which slips inside a heavy duty outer sleeve. This outer sleeve operates as the 'cover' of the inner box as well. The outer sleeve has some decent graphics but it's a tad sparse on text, and it doesn't mention its limited edition number anywhere. Slide out the inner box, and you have solid urethane foam trays (top and bottom) holding the base and figure completely still and far from the edges and each other. No way this guy is going to get damaged in this box, short of getting stepped on by Godzilla. While there was no edition number on the outside of the box, there is a nice little COA inside that is folded book-like. It's made from a high quality material and is quite nice. These are metal figures, but aren't made from some cheaply smelted alloy that's so brittle it can break with a little pressure, or some offshoot of pewter or lead that bends at the slightest touch. This is some serious metal, with a lot of heft and a very solid, high quality feel. The figures are done in about a 4" scale, slightly bulkier than the 3 3/4" Hasbro action figure line. 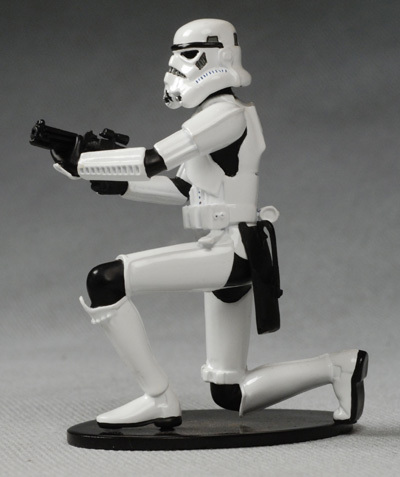 This guy is about 3 1/2" tall, but that's because he's on one knee, and the standing troopers in this line are closer to 4 1/4". The sculpt is excellent, with appropriate detail and very good proportion and internal scale. The size of the helmet, the size of the arms and legs to the torso, and even the size of the hands and feet seem accurate and appropriate. There's some small detail work on areas like the helmet and gun, and considering the scale, these are well done. Is the sculpt better than the Hasbro action figures? Well, it certainly looks more like a real person in an armored suit, even in the metal medium. Considering how small these guys are, that's quite and accomplishment. Obviously there's nothing 'cast' in the color here, and everything is painted. Not only that, but the application is very thick and high quality, helping to ensure that the figure won't chip too easily. The areas of greater coverage, like the white, even have the look and feel of a heavy enamel coverage like you might see on a metal appliance. When you're talking about quality here, you're not just talking about how clean the cuts are or if the coverage is consistent, but the quality of the paint itself and how that paint has been bonded to the metal. I suspect a lot of the cost of these guys went into this high quality paint application. There's still a few little blips and blurps on some of the small details when viewed through the eye of the camera, but through your natural eye, the won't be easy to see. Now, I don't know that this is true for the human characters, where subtle variations in paint are more critical for faces. That type of paint work in this scale can be tricky, so I can't guarantee they pulled it off across the board. 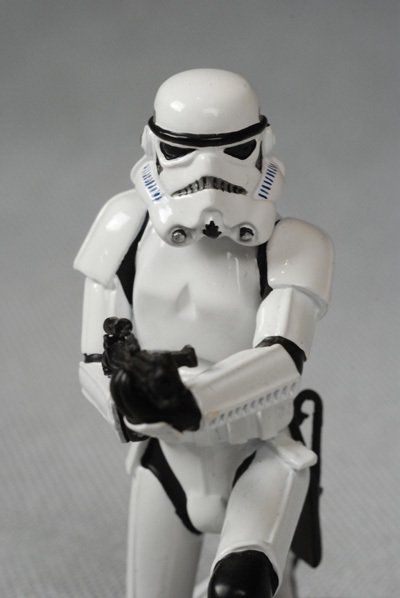 But the troopers look terrific in hand. In case you weren't paying attention, these are solid metal figures. I won't be taking anything off my overall because of this, but I wanted to point it out in case you were expecting a joint or two. 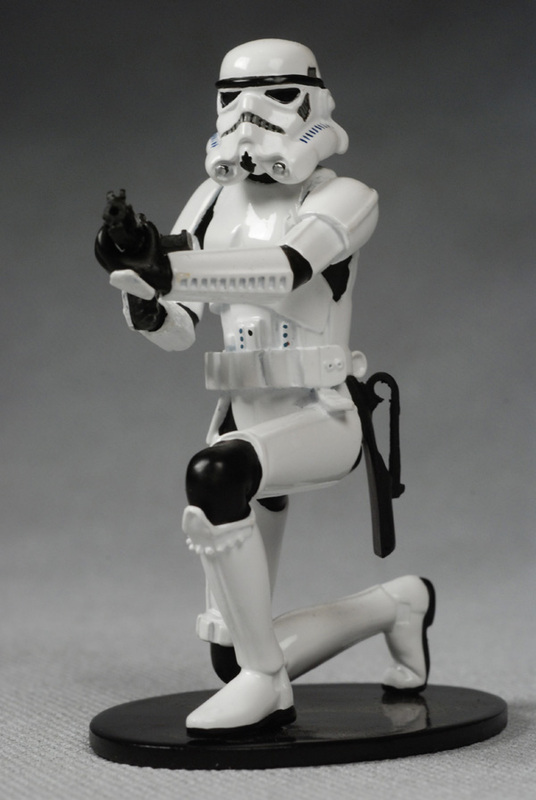 If you're looking for a different pose, try one of the other metal Troopers they produce. These aren't toys, at least not in the traditional sense. Oh, there's nothing here that makes it impossible to play with them, and in fact, they are like uber versions of my old plastic army men. Really uber. If you're a well known movie actor (you know who you are) and you're looking at giving your kid something that the other kids will drool over, then getting about 30 of these guys with the Death Star Hangar diorama will pretty much do the trick. If I were grading these at the suggested retail of $95, I'm not sure what I'd give them. SRP on the named characters is around $110. It took me a little effort to breathe again after I realized that. I'll give you a second to stand up again...and then knock you back down by telling you the hangar diorama with the half Falcon has an srp of about $3200. Now, the good news is that if you buy these guys on the 'bay, you can find most of them for about half that. My score here is based on that apparent market rate. Still, $40 - $50 for 4" of anything made of a metal without the word 'precious' in front of it is mighty steep. Most folks might pick up their favorite character, like Vader, but they aren't going to have the bones to drop for the full diorama and the necessary figures to go with it. But with something like this, that's part of the point, isn't it? You're getting something that isn't going to be gracing a whole lot of collections out there, and will truly set yours apart from the rest. Are these really worth that kind of green? That's going to be something you'll need to figure out for yourself - my score reflects my thoughts. Don't go dropping them, since chipping the paint on something you just spent a Benjamin on can cause extreme emotonal distress. You might think that's obvious, but he doesn't stay attached to the base that well if you tip him upside down, so don't go thinking you can hold on to him that way damage free. I've never given such a high quality product such a low overall score. With something like this, at least for me, there are only three aspects that count - Sculpt, Paint and Value. Both the sculpt and paint, and the inherent quality of materials that go with them, are terrific, and if I were a man of some means I'd love to have the full diorama with a ton of these all on display. But the price - ouch! 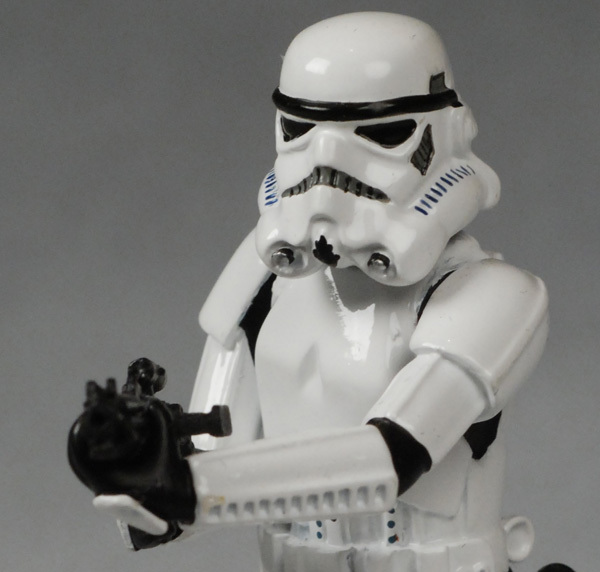 This guy is sort of the Ferrari of Stormtroopers...but how much of the $40 or $50 price tag is not about the quality but rather the status symbol of owning it? And I'm not even considering the SRP! In the end, if the Value score is of little concern to you, then this guy is clearly a much better overall collectible than my final score reflects, and is a perfect example of why I break up my reviews into sections. If you're a huge fan of an individual character, like Vader perhaps, I can see looking to snag your particular obsession when you can find it cheaper on ebay. And if you're looking for a display that will blow your friends away, then the full set with the Falcon/Hanger diorama is the show. Just don't forget that the price of admission isn't cheap. I can't believe I'm saying this, but ebay is probably your best bet. Check out Attakus' site for more info on the metal line up!